Nestled amongst the farm and forest woodland terrain bordering the tiny village of Orono, just east of the cosmopolitan mega city of Toronto, the Trillium Morgan Horse Farm and now the Trillium Equine Complex, makes its home sheltering many champion Morgan horses. 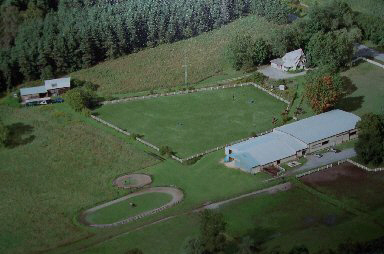 Farm Site I is the main stable and hub of activity. Farm Site II is the crop production for Trillium. Owners Robert and Catherine Sampson have actively been involved with Morgan horses for more than three decades. The evolution of their modern equine complex has been a labour of love, hard work and dedication, spanning some thirty odd years. Today, the Sampsons are noted authors and presenters of many unique programs at the farm. Catherine Sampson is also a guest writer for several horse publications, including the popular Horse and Sport magazine, Horse and Country, Horses in Canada, The Morgan Horse Journal and Equus where her feature articles are published regularly. Catherine is also available for public speaking engagements and training clinics. To book Catherine for your future events and clinics, please contact the farm. Catherine served two terms as President of the Ontario Morgan Horse Club and had been on the board of directors for 10 years. She is a long standing member of the Canadian Morgan Horse Club and the American Morgan Horse Association. After years of breeding, showing and training, it wasn't until the late 1980s that the farm's direction would shift towards a different path. As a pilot project, the Sampsons held mini training sessions for new owners of their horses. These educational meetings were received so enthusiastically, that the farm began an initial series of workshops, developed for the general horse owner at large. With each new year, workshops were created, enhanced and expanded. At present, the Trillium Morgan Horse Farm has successfully hosted more than 200 workshops, covering a vast agenda of topics and themes, everything from rider psychology to photography. Attendance has come from as far away as Indianapolis in the south to Thunder Bay in the north. Building on the many successful years of workshops, the Trillium Equine Studies Short Course Program was born in 2001. Along the lines of the Short Course Program, a Trainer’s Apprenticeship Program made its debut in the fall of 2002. The six-month apprenticeship provided successful candidates with a wide variety of training opportunities and general stable management practices. These programs more than adequately achieved their targets and have since been retired. For a number of seasons, the farm's seminar facilities have been donated to the Durham East 4-H Horse Club as their headquarters. As well, this keen group of future horse owners, have access to the farm's horses for their educational sessions. Both the Ontario Morgan Horse Club and the Canadian Morgan Horse Club Zone, have selected the farm's excellent seminar facilities for their general meetings on occasion. In the fall of 2005, the farm will host the 4-H Ontario Horse Leaders Conference, with Catherine Sampson delivering a day of mini workshops, as well as sharing her knowledge in teaching and farm mentoring programs.